(Published early May) Stand next to your blueberry bushes, your maple trees and birch trees, your cherry and apple trees. Are flower buds turning brown? Are nascent leaves been eaten to the point that they resemble lace? In early morning hours are small green caterpillars dangling from silken threads? Are you thinking - maybe I should spray? Too late. Winter moth eggs hatched in early April. The tiny, tiny hatchlings climbed inside beginning-to-open leaf and flower buds and nibbled them from the inside. By early June the full-sized caterpillars will descend to the ground where they will transform into pupae, not to emerge as adults until late November and early December. The reason for this topic now is to help you to identify which of your trees are in duress. Some of them will have the reserves to produce a replacement set of leaves, but unless you start some moth management going forward your trees may join the standing dead in a few years. moths stuck, dead or dying. The females are climbing up from the ground. door frames in the evening and early night if an outside light is on. 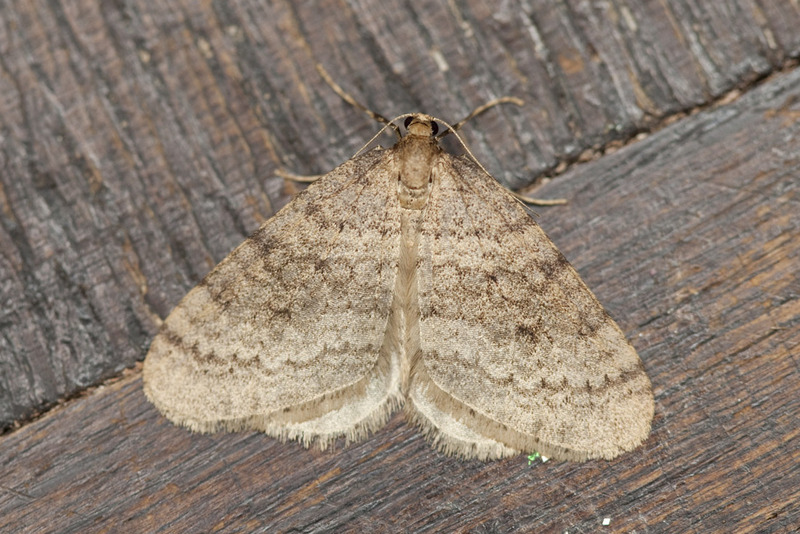 Winter moths, native to northern Europe, reached Canada in the 1930s. The introduction was accidental, the problem monumental. The "winter" part of the name refers to an evolutionary strategy used to avoid predation. Most insect eaters (birds, bats, spiders, wasps and other insects) are active during warmer months. By not emerging until after November frosts, there perils are avoided. This plague appeared in eastern Massachusetts around 1990 and to date has slowly spread to affect land within the I-495 arc and down into Cape Cod, but not farther west. Yet. Winter moths have an interesting dimorphism. Males have strong flight muscles, with an ability to pre-warm these muscles through shivering before cold weather flight. In contrast, females have only vestigial wings. Sacrificing flight capacity allows more than fifty percent of their adult body weight to be given over to eggs. Mating is achieved after the females climb up tree trunks and then release scent pheromones into the air. Males fly to them. Given a choice, males prefer larger females with smaller wings. The non-flying nature of female moths means that individual trees can be treated by putting sticky products such as Tree Tanglefoot around tree trunks in mid-November. Instructions are to wrap the trunk in plastic wrap or some other material and put the sticky stuff on that rather than directly on the tree. This is kept on through mid-December. Help is on the way. Canada successfully introduced parasitic flies and wasps from Europe, both specific to preying on winter moths. The U.S. Department of Agriculture has been experimenting with this approach. The net result is a downgrade from chronic traumatic damage to acceptable damage, with occasional bad years. However, until these bio-controls are in widespread use, best advice is to sticky-band trees in the fall as much less expensive than spraying dormant oil or insecticide in early spring. is covered with thread-thin, poisonous, barbed spikes which in sensitive individuals elicit a poison ivy like reaction. Worse, the spikes are easily dislodged, often became windblown, and if inhaled, cause moderate to serious respiratory distress. In time, natural predators adapted to browntail moths, so there are only remnant populations along the Maine coastline and parts of Cape Cod. Gypsy moths were deliberately brought to Medford, MA in 1869 in an attempt to start silk production from cocoons, escaped, and spread slowly. Despite millions of dollars spent, eradication efforts failed. Suppression efforts have successfully used combinations of insect parasites, fungal and bacterial species toxic to gypsy moth caterpillars and a species-specific deadly virus. Females resting on birch tree, waiting for evening to climb up and mate. Winter moths are not the only bad thing happening to your trees. Oriental bittersweet, an invasive plant species from Asia, climbs up trees and kills them by a combination of blocking sunlight and weight. Hemlocks are dying due to wooly adelgid infestation. Ash are succumbing to Emerald Ash Borer and diseases, fungal infection has killed off most of the flowering dogwoods, and the Asian longhorned beetle will eat almost any type of tree, but is partial to maple, elm and willow.